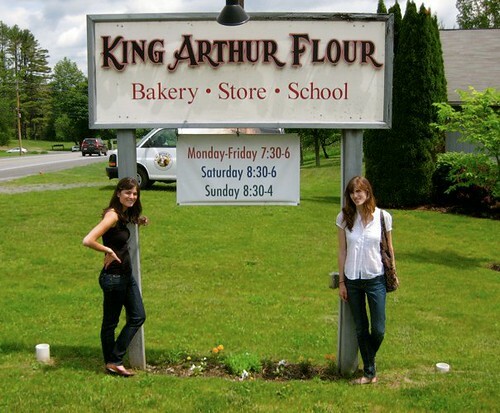 You may recall that last summer I spent a weekend in Vermont with my mom and sister, the highlight of which (for me) was a trip to the King Arthur Flour bakery and store. The KAF Bakers’ Banter blog was one of the first food blogs I fell in love with, for both its superior knowledge of the subject and friendly, easy-to-follow style. 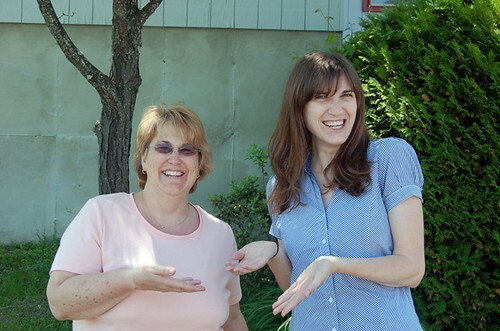 Here I am posing in front of the sign with my sister Courtney in June 2010. While browsing in the store with my mom and sister, it was exciting to know that somewhere very close by KAF baking bloggers PJ, MJ, and Susan were making something delicious. I wanted to find them, shake their hands, and tell them how much fun it was for those of us following along at home. Now imagine my delight when one year later I found myself back at King Arthur doing just that! I was so thrilled to have the opportunity to spend two days this week as a guest of King Arthur Flour for their Blog and Bake. It was a wonderful experience. My fellow bloggers couldn’t have been nicer, and the KAF baking education staff reaffirmed what I already suspected…that they were a group of talented women with a passion for baking, quality of ingredients, and teaching others the skills and techniques for delicious results in the kitchen. King Arthur is the oldest flour company in America, and maintains its fine reputation and loyal following by holding itself to the strictest parameters in the business for consistency and quality. And yes, they are located in New England, in the beautiful Green Mountain State of Vermont. The journey to Blog and Bake was as much fun as the event itself. My friend and fellow Boston blogger Fiona and I were lucky enough to get a ride up and back with Rhode Island blogger Jen from Savor the Thyme. We had never met Jen, but within moments we were having a great time chatting in the car about all of life’s merry topics. She was such a sweetheart to offer a ride to total strangers – thanks Jen, you’re awesome! 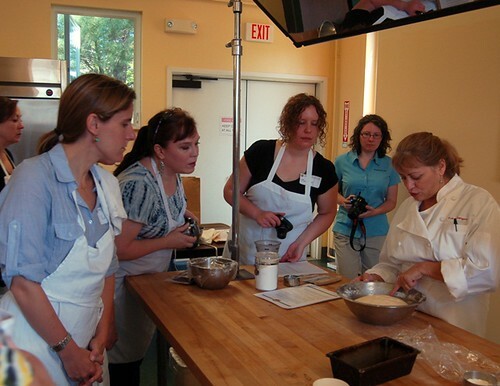 Blog and Bake proper was a whirlwind of classes covering yeasted breads, traditional and sweet pie crusts, scones, overnight pizza dough, and a crash course in the different types of flours and what makes them work for one recipe or another. We also had a cooking demonstration from special guest Sara Moulton! Our instructors and their assistants varied from lesson to lesson, but they worked together as a team to make sure we had all of the information we needed on the science behind the recipe and the techniques we were learning. Knowledgeable and friendly, they gave us their full attention and were troopers during our constant photography throughout their demonstrations. Like I always say, “It’s what we do.” Don’t try and stop us! 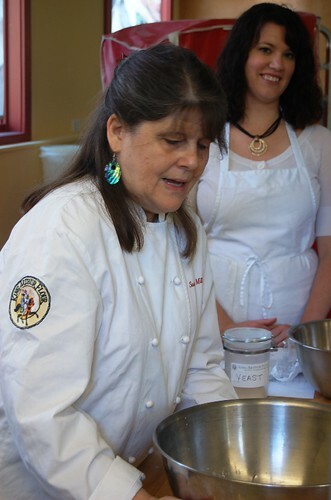 First up was a lesson on yeast and making bread from instructor Robyn Sargent. We each made enough dough for 2 loaves, one traditional and one braided. It was my first braided loaf, and I was very proud. Next up was a lesson on un-yeasted breads that use baking soda as a leavener. 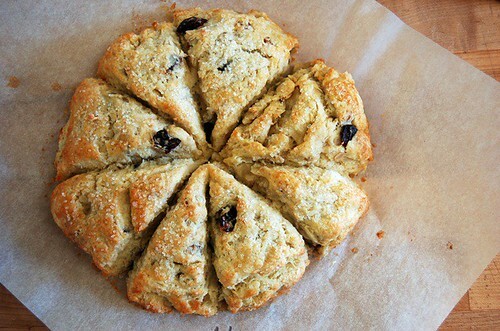 Fiona and I teamed up to make a batch of cherry oatmeal pecan scones. They were seriously delicious…buttery, tender, and not too sweet. This is how a scone is supposed to taste, people! 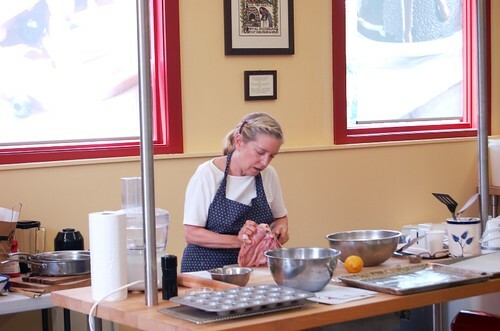 After a delicious lunch of hearty cafe sandwiches and salads, it was back to the classroom for a lesson from instructor Susan Reid on the different varieties of flour and the way they affect the results of what you are baking. 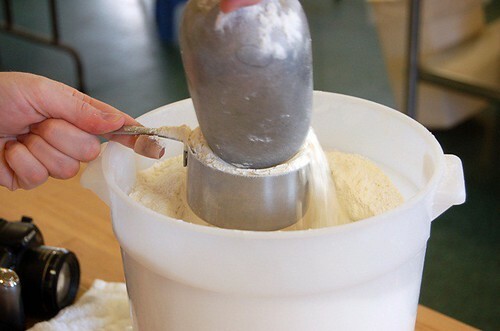 We were each given an equal amount of a different variety of flour and told to mix it with identical amounts of water. It was amazing how much the consistency of the resulting mixture varied in both color and texture. 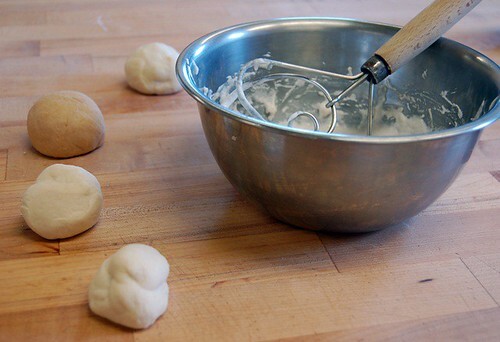 The balls of dough were also really fun to play with. 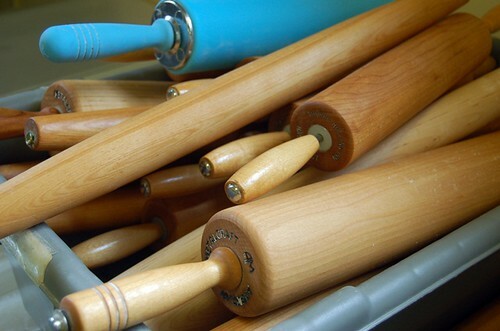 The original stress ball, my friends! 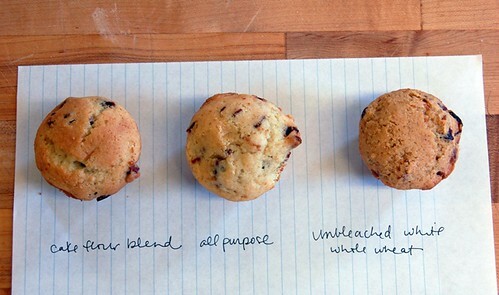 The difference between the flours was further illustrated with an assortment of mini muffins made exactly the same, except for the flour. 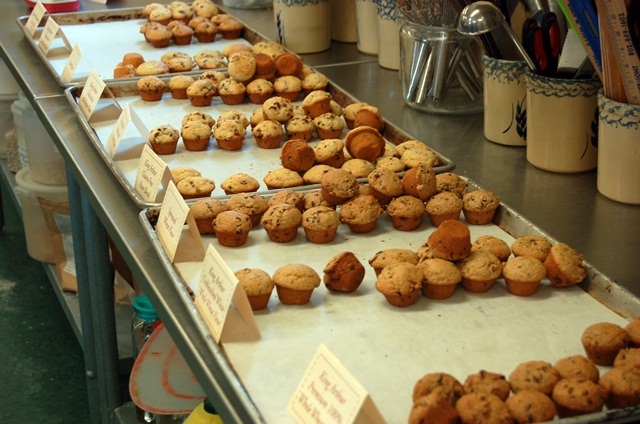 Susan made A LOT of mini muffins to hit the point home! Before the day ended we broke into teams and made two batches of pre-fermentation “poolish” to use for our pizza dough the next day. Then, we made our way over to watch a cooking demonstration from chef, cookbook author, and television personality extroidinaire Sara Moulton. Ms. Moulton was an absolute delight. In addition to her vast knowledge of food and cooking, she was also warm, funny, and interacted with us throughout her entire demonstration. What a treat to meet her and watch her break down some chickens! Then it was back to the Norwich Inn, where we stayed while visiting King Arthur. 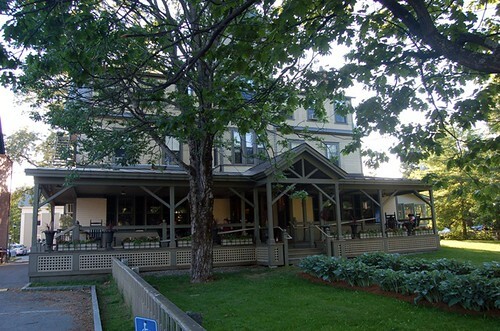 It’s a beautiful old inn with armloads of charm and character, complete with rocking chairs clustered on its front porch. For dinner that night the staff prepared the same meal Sara had demonstrated for us at the King Arthur Baking Education Center. 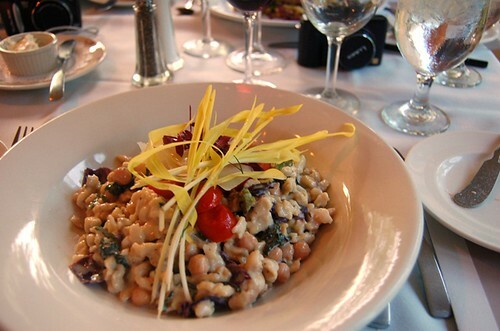 Always the squeaky wheel, I couldn’t eat the chicken, so they were kind enough to make me one of their regular vegetarian dishes – herbed spaetzle with chickpeas, cabbage, and broccoli raab in a roasted garlic cream sauce, topped with tomato confit and fresh corn shoots. It was darn good, and I had a wonderful time chatting with fellow bloggers Maryellen and Corin, and hearing inside stories on what it’s like to work at KAF from blogger and Baking Sheet editor Susan Reid and test kitchen blogger MJ Robbins. Then it was off to bed. I don’t think I even got through one episode of my current favorite Netflix show (ahem*BONES*ahem) before I was asleep. Definitely the sign of a busy day! Our second day at King Arthur started with a lesson from Baking Education Center Director Susan Miller on the wonders of pie dough, both traditional and sweet. 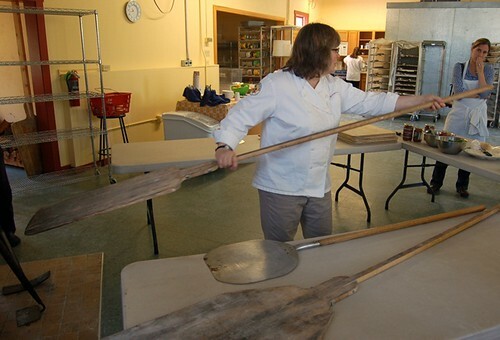 We watched her expert demonstration, then set about making our own pate brisee and pate sucree, respectively. While the doughs chilled, it was time to get out the poolish we had started the day before, and turn it into pizza dough! 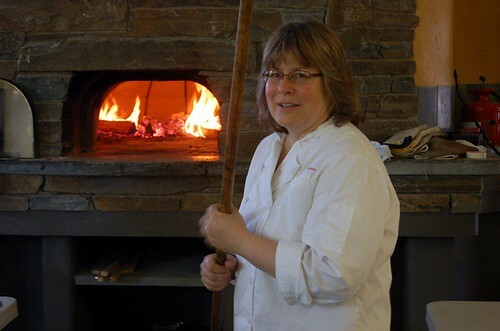 Pizza at King Arthur Flour means “Wood-Fired Brick Oven Pizza.” Wood-fire baking expert instructor Michelle Kupiec guided us through the ins and outs of the massive oven, and demonstrated her maneuvering skills with the giant wooden pizza peels used to get the pies in and out of the oven. 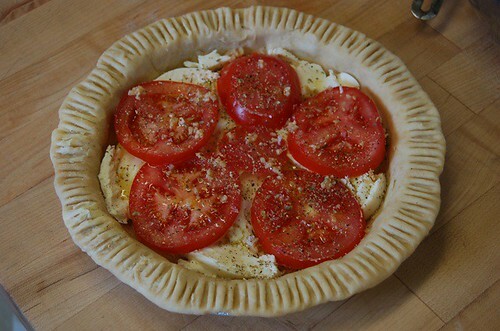 Sidenote…I hate when people refer to pizzas as pies, but I just did it and it’s staying. 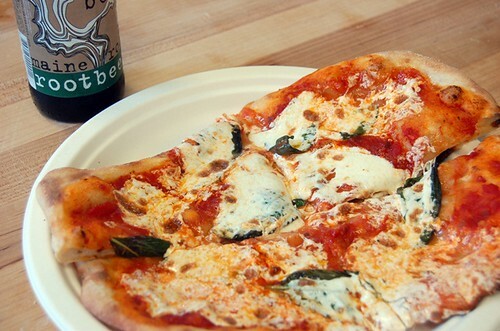 I can tell you that despite how unattractive it looks here, my margherita pizza was perfection. So was the Maine root beer! This is my kind of lunch. We rounded out day two by turning our chilled pie doughs into two beautiful dishes – a tomato and fresh local mozzarella pie, then a sweet strawberry and rhubarb tart with a lattice crust. I love how both looked unbaked. Both the pie and the tart were perfection. The pie crust achieved that perfect balance of flaky and tender, while the tart crust was sweet and shortbread-y. Perfect for its fruit topping. 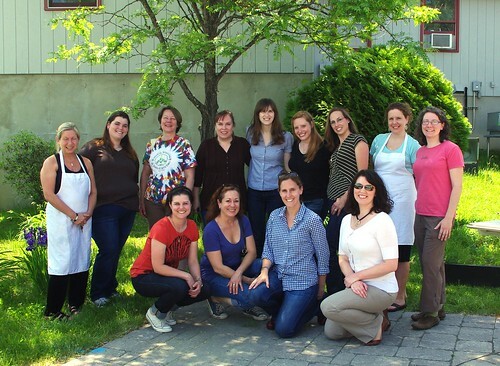 I absolutely encourage any of you out there to take a class at the KAF Baking Education Center– I promise you will not be disappointed, and you will not leave hungry! I am going to get into more detail on what I learned in my next few posts. Specifically in the areas of bread and pie. We all like bread and pie, right? Missing from the picture is Corin, who could only make it for day one! Casey from Good. Food. Stories. Terri from KAF. She doesn’t have a blog, but she’s new at KAF and she was lovely! Special thanks to the wonderful KAF staff (in order of appearance): Allison Furbish, Robyn Sargent, MJ Robbins, PJ Hamel, Susan Reid, Susan Miller, and Michelle Kupiec. They packed every moment of our time at KAF with fun and learning. I even got MJ to pose for a photo with me! Her decorating skills are incredible. Hi MJ! 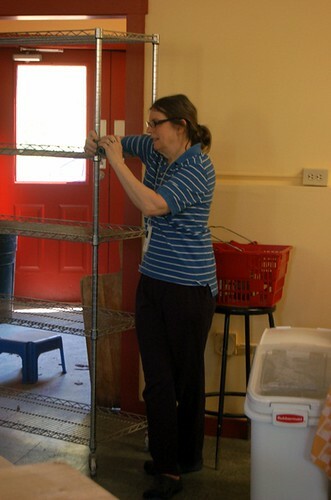 PJ was also snapping away during our visit for her own recap on the KAF Bakers’ Banter Blog. You can read it here! Thank you so much, King Arthur Flour! I had an amazing time. More to come! Weee! This looks like my kind of weekend! Pizza, pie, scones = heaven. 🙂 Thanks for letting us live vicariously through your stories here. Well done. Love your photos! … Enjoyed reading about your visit to KAF with your family — nice way to pull it all together 🙂 . What a great experience. I bet you learned a lot of wonderful techniques. Thanks for sharing. Hi Cathy! 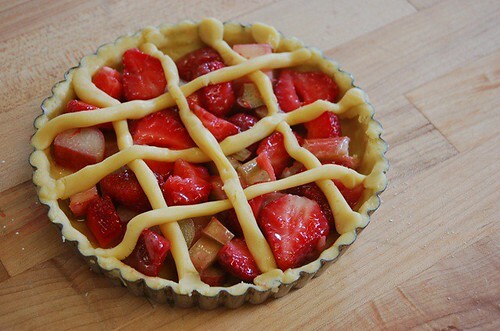 I did and I am just itching to get into my own kitchen this weekend and try to recreate them. Looks like I should be visiting your blog for more bread-making tips and tricks – which I will! Thanks for visiting! Sounds like such an amazing trip! Can’t wait to hear about everything you learned. 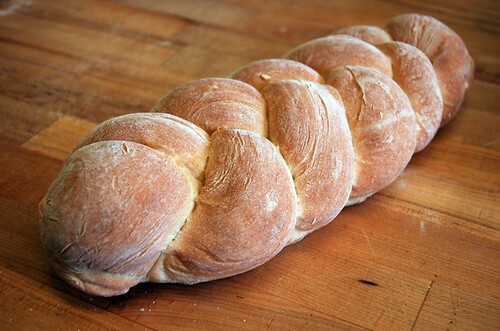 Your braided bread looks divine. All of the food looks so amazing! What an awesome trip! You are amazing, awesome, kind, generous, and a geniune spirit. In case it is not coming across, I like you. Hope to see you soon! 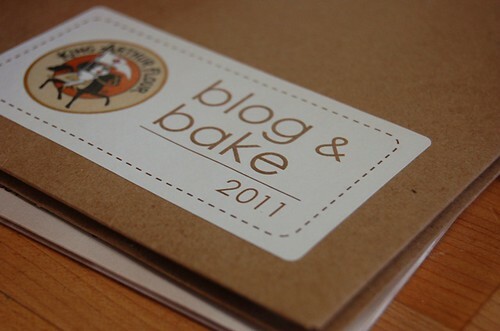 The Blog and Bake looks amazingggg!! I didn’t get to see your spaetzle from the other end of the table – that looks INCREDIBLE and I might be snagging that preparation for dinner later this month. Hi Casey! It was so, so good! I had also never eaten a corn shoot before – have you ever had one? It’s like a corn explosion! Love your blog and LOVE this post!!! Thanks, Stacey! It was a lot of fun and I ate like a queen. Always a winning combination! BEAUTIFUL! I love it! Thanks for letting me pester you with questions! Thank you for letting me be a loudmouth next to you for 2 days straight! Your baked goods all came out perfectly – you can’t claim to not be a baker anymore! What a wonderful event. I did something similar last fall, and it was without a doubt one of the best weekends of my life! 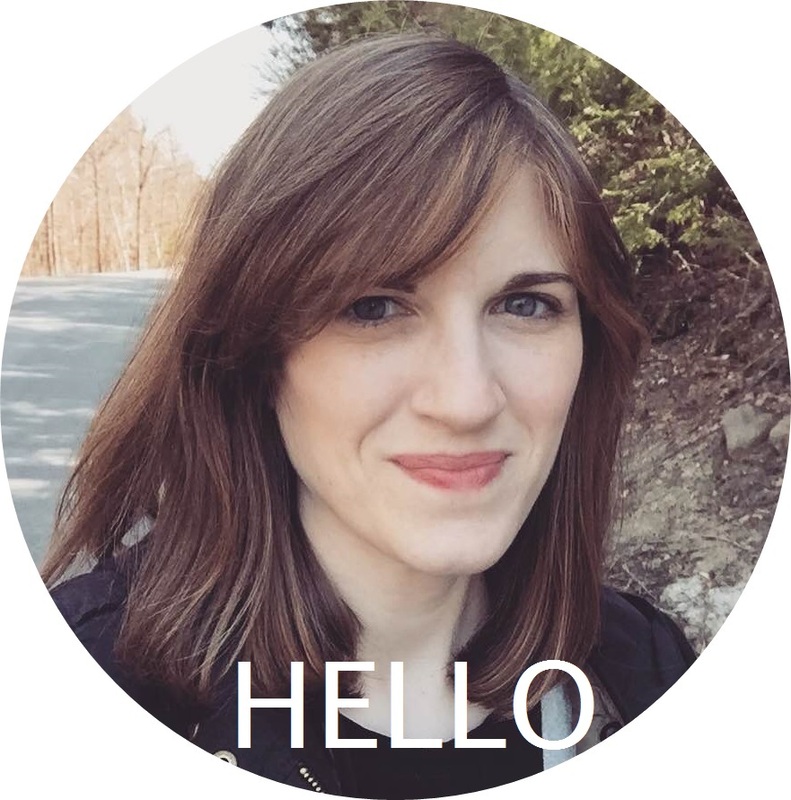 Great blog Amy! It looks like youre prepared to experience the bagel factory next…!!! Wow, what an amazing experience! I love King Arthur flour…I use their bread flour all the time.